The Scientific and Technical Centre for Building (CSTC) released the standard NBN 16301. This standard establishes a standardized procedure to objectively measure the efficiency of stain repellent products for natural stone. 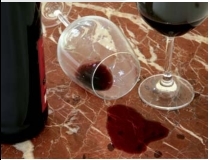 First of all we emphasize that the CSTC doesn’t recommend any particular technique for stain removing, but defines the method for the “ application of stains, cleaning and evaluation of the aspect of the surface after cleaning”. The CSTC has chosen 6 « stain agents » for its study, selected for their basic, acidic or viscous character : olive oil, lemon, ketchup, red wine, coffee and cola. For each of these substances, two stains are applied on the floor. (and its finish) to be tested. The first stain is cleaned ( by means of a standardized method with a neutral an non-abrasive solution).after 15 minutes and the second stain after 48 hours. The stains that persist are finally evaluated by the classification of the standard. The CSTC takes more parameters into account such as the porosity of the stone, gloss, water absorption, the solvent or water base of the cleaning product and its active ingredient. This allows to determine the most efficient cleaning product depending on the type of stain and surface. The complete results of this study have yet to be published by the CSTC. The efficiency of treatments to clean external stains has been demonstrated. The efficiency of treatments for cleaning acid stains (lemon) however is less demonstrated. Finally, it appears that the type of finish also has an impact; a brushed or flamed finish reduce visibility of stains for the same type of stone compared to a polished or honed finish. Emotion Pierres will keep you informed of the obtained results by the CSTC when they become available and will not hesitate to benefit from this standard to complete internal results.